Lie 4: "Oil exploration and exploitation support the UN peace process"
The United Nations peace process in Western Sahara started in 1991, when the UN could broker a cease-fire between Morocco and the Saharawi liberation movement Frente Polisario. 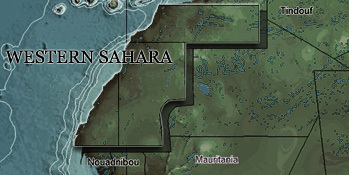 Both parties agreed to allow a UN peace mission into the territory, with the task of organising a referendum on self-determination in which the Saharawis could freely decide the political status of their homeland. After years of complicating the referendum process, Morocco flatout rejected any referendum that includes the option of independence since 2004. Nevertheless, the UN-mediated between Morocco and the Frente Polisario continued within the framework of the Saharawis' right to self-determination, though that process has also become deadlocked due to Morocco's intransigence. “It is our view that responsible resource exploration and, if successful, development in Western Sahara can and should occur in parallel with the UN-led discussions on the region’s future. We believe that it (resource exploration and development) will not, and need not, prejudice the negotiations or the outcome of that political process.” Kosmos Energy, Position Statement on Western Sahara, February 2014If one were to believe the oil companies, their decision to team up with the Moroccan government to look for oil in occupied Western Sahara will not affect the outcome of the UN peace process. This is hardly credible. Besides offering a highly inappropriate sign of support to Morocco’s untenable claim over the territory, the companies are actually complicating the peace process by supporting Morocco in its uncompromising attitude in the UN-led talks. If oil is struck in Western Sahara, Morocco will become even more determined to maintain its presence in the territory, particularly in view of the country’s soaring energy bills. Strengthening one of the parties to the conflict cannot be viewed as neutrally supporting the UN peace process, but rather as the opposite; it is taking sides – the side of the aggressor to the conflict. The companies have never consulted the Saharawis, have never informed them about their plans, have never even asked for their opinion, let alone for their consent. There is an overwhelming bias in support of Morocco’s position. "Our operations in the Southern Provinces are in line with fundamental ethical norms, and actions to inhibit them are not merely incorrect but work counter to the interests of the local population and against the final resolution of conflict." Oisín Fanning, CEO San Leon Energy, July 2015It is difficult to see how such actions could contribute to a just, lasting solution that respects the Saharawi people’s right to self-determination, when the oil companies themselves don’t even show the most basic respect for the Saharawi’s rights. If the involvement of the oil industry will lead to “a final resolution”, as San Leon’s CEO seems to suggest, it will not be to a just and lasting peace, but to the further Moroccanisation of Western Sahara.